does my dog need to attend everyday? No not at all, we have dogs who attend 5 days a week however mostly are one to two days per week. We don't deduct play passes if you are on holiday, as long as you give us a little notice for staffing. can I bring my dog down as a one off? Unfortunately not, we don't have the spaces to accommodate this, it is also in my opinion not great for the dynamic of our packs. Will my dog required to be assessed? All our dogs with the exception of puppies need to pop along to our centre any evening Tue to Frid at 545pm for an assessment to determine if he/she will be suitable to join our pack. What vaccinations does my dog require? All our dogs must be fully up to date with all their main vaccinations and also have the kennel cough (bordetella) vaccine. We must also have a copy of this before he can join our pack. We also send out reminders when our record show they are due their annual vaccination and we will again then require a copy of this before he can return to play with us. can I come down to visit your centre? Of course! We arrange tours in the evenings Tuesday to Friday at 545pm, just drop Shirley a text (07717583475) so we can confirm the appointment. If you want to bring your furry down for a play whilst we show you around please bring their vacc card with you. (they do not need kennel cough to tour/screen but require it to join the pack) We also have live camera feeds throughout the centre which you are more than welcome to watch at any time during the day if you cannot manage at 545pm. What are the hours you operate? We open Monday to Friday at 730 til 6pm. You can drop your dog off from 730-11am and collect from 2-6pm. We can offer a later pick up time should this be needed. how do I access the live webcams? We are totally transparent and want you to be able to see your dog playing with us all day. So as soon as your dog joins our pack on his first morning text Shirley and she will then send you all the log in/app information so you can watch them. You are able to record and take pictures with the webcams that are throughout the centre. Does my dog have to be neutered or spayed to join the doggy day care? 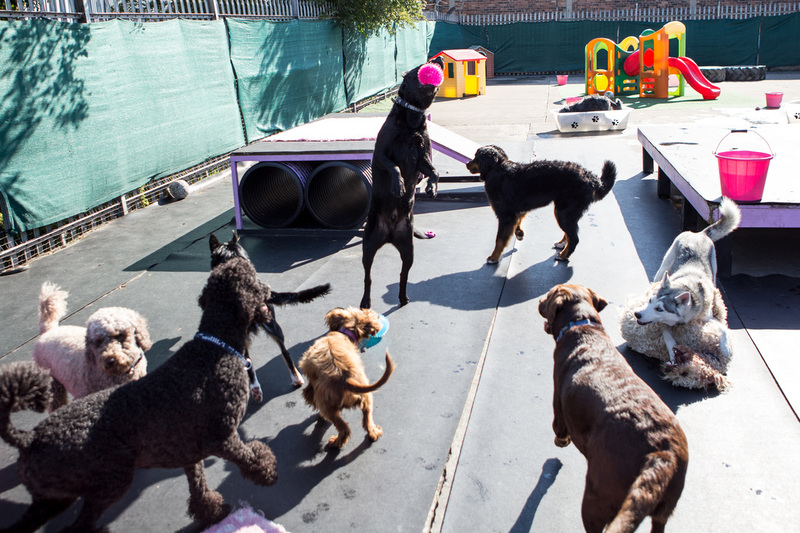 We allow dogs to attend doggy day care until they are 10 months old (however should they start showing any "flag" behavioral changes we would have to reassess and chat to pet parents about how we move forwards) thereafter they would need to be either neutered or receive the contraceptive injection. how much do you charge for a day? We are open for 10.5hrs per day, in light of this our prices are of course more than an hours dog walk. We charge £21.50-£25.00 per day (VAT is included in this price) depending on what play package you buy. They are sold in blocks of 5/10/15/20. We deduct a play pass everytime your dog comes in for the day to play with us. If you have two dogs you can split one block between them saving you more money. how do you handle my dog throughout the day? We never raise our voice to our dogs, always calm, consistent handling and always fair! Our dog handlers promote good manners within the pack and do not allow bad behavior, ie bullying, aggression, etc. Do you train my dog or pup? Yes absolutely, we are dog day care trainers. Your dog will learn basic manners, distraction recall and how to play in an appropriate manner with other dogs. All using force free positive training methods. ﻿"Our dog Harry has been going to Safe Paws for over 3 years and absolutely loves the experience. We then re-homed Hamish who was not socialised and a miserable wee soul. We were nervous as to how he would fit in at day care but over a very short period of time with the love and care of the Safe Paws team he has become unrecognisable . He is confident, happy and eager to join in the adventures at day care. Both Harry and Hamish enjoy their time at Safe Paws and we cannot thank Shirley and all the staff enough. We can thoroughly recommend Safe Paws to your furry friends and other dog owners﻿﻿"